By doing this you bring hope and a better future for hundreds of Romanian kids ! Are you looking for an easy, efficient way to publicize your company all while lending a hand in our battle for English literacy? Then consider sponsorship, the perfect way to advertise your business while helping a noble cause. By becoming a sponsor, you will have your company logo displayed on all public documents and merchandise (including the home page of this website), and will receive a complimentary t-shirt and certificate of appreciation for your generous affiliation. Our organization accepts a variety of donations that fit any budget or circumstance. All your gifts, no matter how big or small, will bring us closer to achieving our goal of Romanian-English literacy. Donors who give over $1000 will receive a complimentary t-shirt and certificate of appreciation. If you have any new or gently used books you would like to give to our cause, please drop them off at the address listed below. 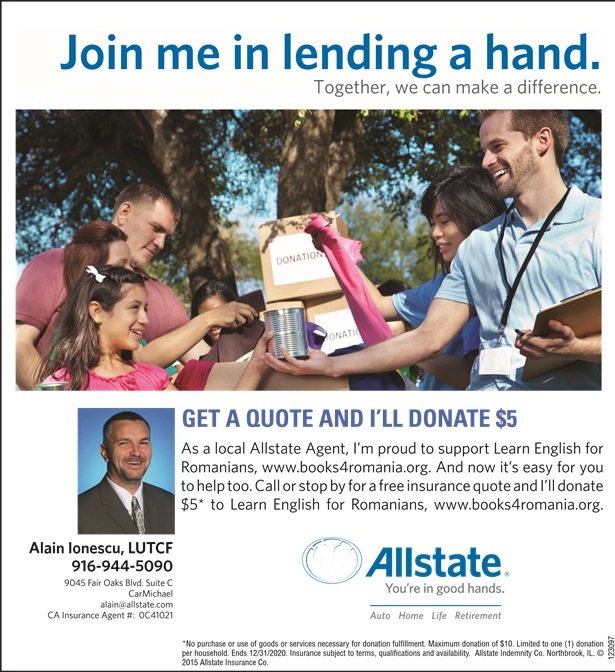 Book donations are highly valued and allow children in Romania to experience the wonders of English literature, an irreplaceable blessing that the vast majority of them never receive.